Scoliosis, derive from the ancient Greek word ‘scolio’ means twist and turn, and this common term is used to label a lateral deviation of the spine with rotation, which may be functional or structural. Functional scoliosis is a mis-organization at a muscular level, promoted by inefficient use of the physical body, poor postural habits, asymmetrical activities, or compensation due to injury. At this level, the spine has full potential to reclaim its optimal support. Though when left unattended over extended period, a functional curve may turn persistent thus limits its recovery potential. Structural scoliosis affected by the dysfunctional growth structure of the skeletal beyond the muscular layers. It may be an uneven growth of spinal vertebrae, or neurological therefore affect the growth structure from birth, rare chromosome disorder, and other causes yet unknown to medical science. Though very little could be done on the skeletal level here, there is much potential at a muscular and organic level for physical reorganization thus regain optimal functionality. How does Yoga for Scoliosis work? How long does the treatment process take, and are the results sustainable? Is it an alternative treatment to the clinical treatments by orthopaedic specialists? Can one with fused spine practise yoga? These are some of the questions I had when I first came to the practice. There are numerous researches in recent years being carried out to explore the effectiveness of yoga therapy for various medical conditions. Over the past decade, many doctors are recommending yoga to their patients. Several well-respected health institutions and wellness centres are fully incorporating yoga into their programs, and some health insurers even recognize it as part of preventive health. In most scoliosis cases, one may not recognize the plumb line or mid-line (where head is in-line with the pelvis in standing upright position). Being lack of awareness to his/her center of gravity, the sense of postural alignment and balance may be skewed and challenged. The proprioception of one with scoliosis may need to be 'reset' to experience 'symmetry'. There may be experience of mental and emotional distress due to the imbalance. A consistent yoga practice could potentially help one to re-map healthy alignment of the physical body, establish a new balance by recognising the relationship with gravity, at the same time release any psychological tension. 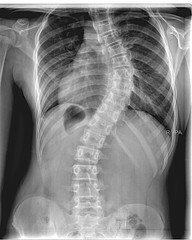 Thus opening up a new perspective towards living with scoliosis. Beyond the physical benefits of the above mentioned, yoga empowers the individual with positive self regard, unconditional compassion to self and others, allowing the practitioner unlimited resource for self healing through awareness. One who has undergone and recovering from a fused spine could work similarly with this approach. Though, in situation when the cardio-pulmonary function is compromised, and progressive, most Orthopaedic Surgeons would recommend immediate surgery. Surgery offers an aesthetic and functional adjustment to the structural vertebrae, but not always for the rest of the tissue layers, muscles and organs. Especially within structural scoliosis, the displacement of soft tissues and organs may not have caught up with the adjustments made on the spine. As pain and discomfort often manifest through soft tissue, organs and the in between layers, some post surgical cases may not necessarily address this. Having been diagnosed with scoliosis at age 13, my S-curve progressively increased during teenage years. I experienced pain, aesthetic imbalances, frustration, disabled, restless sleep and a sense of helplessness throughout my late teens. I was suffering from various stress-related illnesses during my early 20’s… until I acquainted with yoga. I approached my scoliosis with patience, learning through practice, exploration, curiosity and hope. Over time this has significantly improved my spinal health and general well-being. Whilst yoga is not conclusive; I confess that I have been a direct beneficiary of how this practice has improved my condition and the quality of my life. The secret is empowerment, refinement to awareness and acceptance without judgement or expectation. This is a work-in-progress... a life long project for some! At a physical and physiological level, it is important to recognize and understand the asymmetry within the realms of one’s muscular and organ systems. By re-educating the muscular function, reorganizing the organ environment, and re-calibrating the proprioceptive sense and center of gravity, one may potentially enjoy a sustainable optimal functioning body. Healing happens at every level when we restore healthy functioning of the body. Yoga encompasses mental and emotional conditioning, to develop a positive relationship to working with scoliosis rather than ‘correcting’ as though there is a problem with the existing body. During this healing process, yoga unveils the full potential of what is inherent within an individual. Through this non-invasive approach, many people with physical and emotional challenges have discovered a new-found freedom within themselves. The length of time to experience changes may vary. From personal experience, a minimum of 2-3 months dedicated practice is essential to experience improvements. The sustainability of the result or further improvement depends on the individual's continuous perseverance in the practice, responsibility towards the physical and emotional bodies, maintenance of spinal hygiene throughout, attitude and respect to the condition. Yoga is an alternative, non-invasive therapeutic approach to scoliosis, but not conclusive. Every practitioner's experience differs. There are lifestyle changes where the practitioner gain increased awareness to healthy postures and living in harmony with the body. Self acceptance is another great gift yoga offers. Besides addressing physical imbalances through asana and pranayama, the psychological and emotional aspects are as important. Therefore, it is highly recommended to have a balance of both restorative and active asana practice when working with scoliosis. Support and encouragement from family, close ones and the yoga teacher are positive factors to the individual's rehabilitation journey. Yoga addresses multi aspects of the condition, supporting the livelihood of the practitioner. Adelene’s interest lies in offering a comprehensive back care management, a long term self care through developing awareness, creating space for self assessment in the student’s own practice progressively. Her classes often include information on anatomy and kinesiology, whilst exploring habitual patterns, active release work, postural and spinal re-conditioning, organic support system, based on the principles of healthy alignment working with gravity through awareness and breath. Find a qualified Yoga for Scoliosis Teacher on www.yogaforscoliosisteachers.com.